Owning and operating your own company can be very stressful. There are countless bills to handle, employees to organize, customers to please, and a building to maintain. With everything you have to take care of, sometimes details are missed. The last thing you want as a business owner is for your heating and cooling system to break down. Your employees will be uncomfortable and, in some cases, unable to work for safety reasons. Your customers will have a bad experience with your business that could potentially harm your reputation. 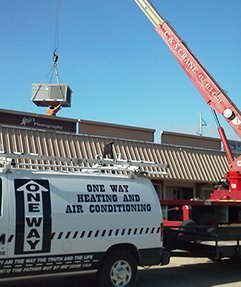 With the help of ONEWAY Heating and Air Conditioning, you can be sure you are always on top of your HVAC repairs and inspections. Our service department treats each maintenance call or emergency service visit as an opportunity to improve comfort while cutting energy costs for our clients. Our service team and engineering department work hard to be familiar with each client facility so we can take a proactive approach to energy saving opportunities. When you need cooling, your company depends on the performance of your air conditioning system. But keeping your air conditioning system in its original peak performance condition year after year demands preventative maintenance and small repairs, as well as operational changes that can be made without extensive costs. Energy Management Systems are becoming an essential component of well-run, energy-efficient buildings. In addition to the set point and night-setback features which can be handled by a programmable thermostat, an Energy Controls System can provide savings in several other ways, including functions such as lighting and water temperatures. Preventative maintenance from ONEWAY means peace of mind — delivered! We know that unnecessary equipment repairs can make a mess of the best business plans. Our preventative maintenance program can minimize surprises, lower your company’s energy costs, and extend the life of your equipment. Prevent problems before they occur. Ask about our Preventative Maintenance Agreements.